While capable of containing a staggering 12.5 liters of water, the Oliso 60001000 Smart Hub Induction Cooktop has definitely been designed for commercial use and for entertaining larger numbers of guests. The machine also has a carafe that can be looked through and the monitoring of the food will be much easier with the see through carafe. The Oliso 60001000 Smart Hub Induction Cooktop can definitely replace many of you older appliances in the kitchen and they even claim that it can do the job of the traditional gas stove and the oven. Even though this is true, do not get rid of the stove just yet! 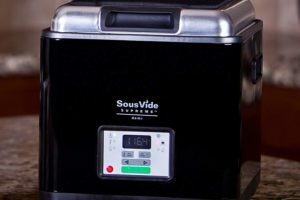 Your food will be much healthier and also full of flavor – the beauty of sous vide cooking! 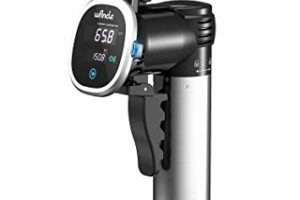 This cooktop does have a 1500 watt circulator and will reach the highest temperatures of any other Sous Vide machine currently on the market, thus improving the speed at which your food can be cooked. The cooktop is capable of cooking nonstop for 48 hours and the temperature regulator will ensure that the temperature does not deviate by more than 0.18 degrees Fahrenheit past the ideal temperature that you have set the food to be cooked at. 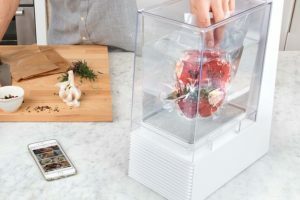 The machine is also quite large, but much smaller than all of your other appliances combined, meaning that newlyweds moving in together might want to consider this Sous Vide machine instead of buying all of the expensive different appliances that might only be used once or twice a year. This machine is also multifunctional and will allow you to cook your soup and oatmeal overnight, while the ribs can be left inside for as full 48 hours to ensure that they fall off the bone when they are ready. One of the biggest pros is the multi-functionality that is provided by the machine and the fact that you can simply buy this to replace or upgrade all of your appliances. The slow cooking features will be great for the colder winter months and there is nothing like a nice bowl of soup when you feel like the cold is killing you from the inside. Since the machine is quite large, you will be able to entertain guests with this one machine and they will all have the same meal cooked evenly. Multiple bags can be left inside and everyone will also be able to monitor the food to ensure that their food is the right temperature. Just be careful with the splashing water when opening the lid. The higher temperatures will also allow you to cook the meal much faster and since it mainly uses water to cook, the machine will not need to be washed after every use. 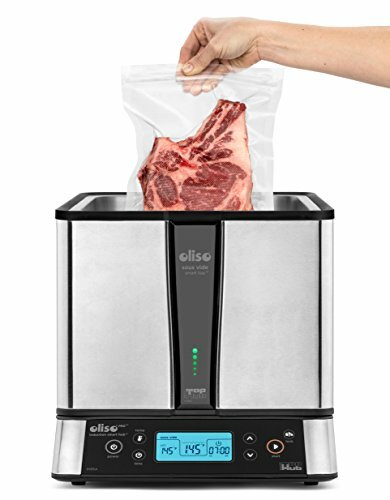 Now you can wipe the machine and simply load the next meal for tomorrow to be cooked. Unfortunately, the dirt will start to stick if you plan on using it as a slow cooker, meaning that you will need to wash it thoroughly to ensure that it is clean and that you can cook the next meal. To avoid rust, you will also need to give the machine ample time to dry, thus meaning that you might not be able to use it for a few hours after a thorough wash.
Another major concern is the price and there is no getting around the fact that this machine is, unfortunately, expensive and will require you to dole out a little more at first, but since there will be no need for other appliances, this can be seen as a long-term investment into your future and your health. The Oliso 60001000 Smart Hub Induction Cooktop is definitely recommended for commercial use and people with larger families. We did mention that newlyweds could benefit from all of the features that will save them money on other appliances as well. The machine can be easily stored in smaller homes as well, you just need to understand that the price is an investment. We would like to thank you for reading this article and we hope that you understand a little better about the pros and cons of this machine. We would like you to weigh in your opinion and let us know what you think about this Sous Vide multifunctional cooktop. 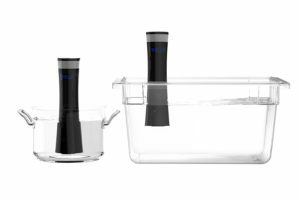 Mellow Sous Vide Review: Convenient Features Worth the Price? Sous Vide Hollandaise and Bearnaise Sauces — What Magic is This?!?!?! Some recommended products may use affiliate links. 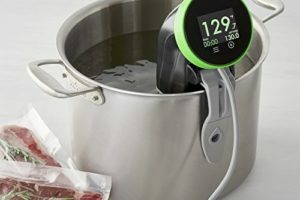 Sous Vide Ideas.com is a participant in the Amazon Services LLC Associates Program, an affiliate advertising program designed to provide a means for sites to earn advertising fees by advertising and linking to Amazon.com. Amazon and the Amazon logo are trademarks of Amazon.com, Inc or its affiliates. 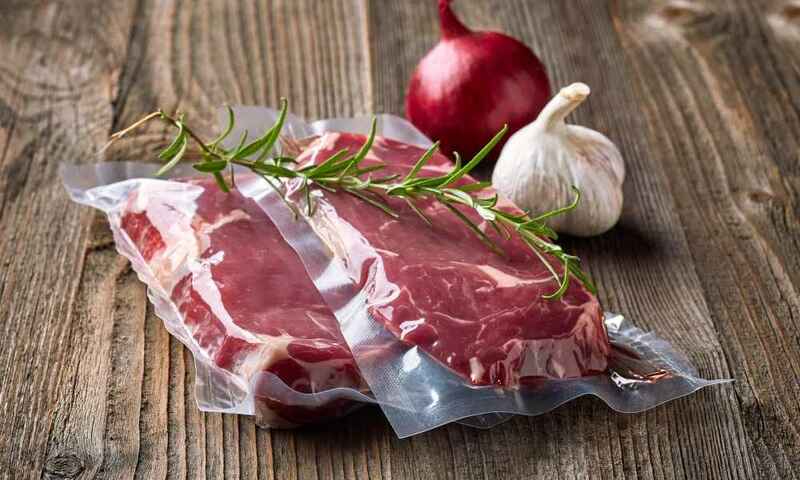 Copyright © 2017 Sous Vide Ideas. All Rights Reserved.